Feel free to add Hardware or Software for comparisons. Software vs Hardware Battles are unnecessary, though. I dont have a dog in it. Digital - for Precision. Analog - for the Unexpected Jitter. 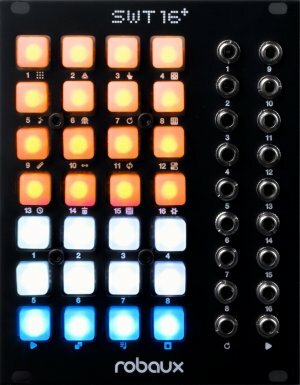 Currently the Undisputed Best Module on ModularGrid. * that Hermod is stiff competition for MI Yarns, and Pamela's Workout. Video starts at the Drums .... Divide MODE. Picked up a few things recently: intellijel shifty, intellijel quad vca, intellijel quadra + expander. All awesome... shifty is just absolutely brilliant. Really cool concept that I haven't explored that much. 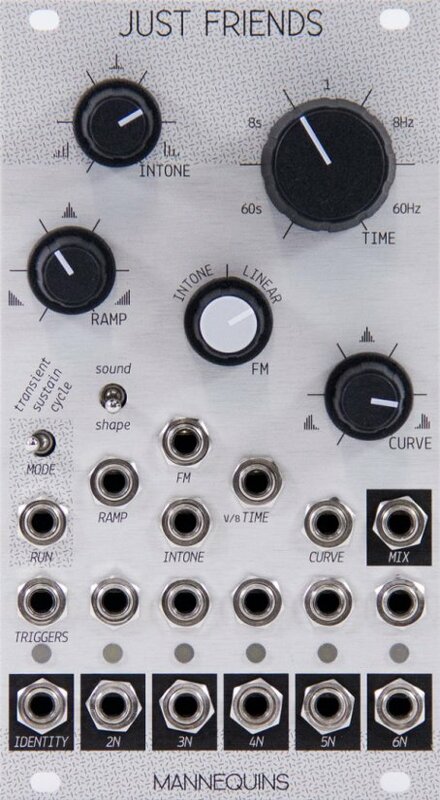 Would like to get it sometime for eurorack but it's pretty spendy at $430 or so. Will have to wait a bit! I want that whole Verbos setup.... ahh, the future. Scan and Pan looks awesome. But, I need Filters. The basic concept is that while almost all step sequencers have some sort of switches per step to indicate if that step is on or off, the Varigate instead has sliders to control the probability that step will fire, from 0-100% like a normal sequencer but including everything inbetween! 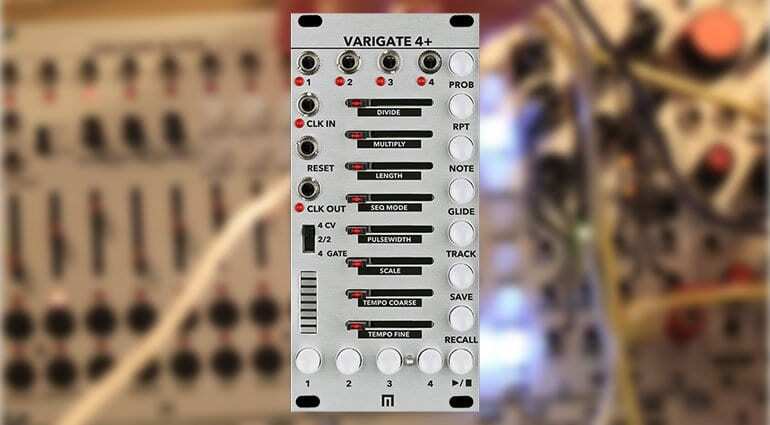 The Varigate 4 is a 4-channel, 8-step gate sequencer with parameter per-step control of PROBABILITY, REPEAT AND DELAY as well as GLOBAL parameter controls. Nice! Thanks a bunch for posting these, O1B. You can never have too many VCAs. .Attenuation, - or the opposite! Last edited by O1B on 20 Aug 2018, edited 1 time in total. NOW SHIPPING: Thanks, Schneiderlade! I couldn't find one stateside! Intellijel seems really low in stock right now - so get 'em while they're hot - if you relish performance control. Gate Generator - Manual Gate button or automatically whenever the joystick is in motion. ... so, how do I get the Drumbrute IMPACT to trigger say, a Soundmachines SimpleDrum-1? to show special statuses. These will be described later. indicate the voltage they are receiving. Mutant Brain is highly configurable, but all changes must be made over MIDI. In fact, there is only one button on the module! Flight of Harmony Choices - for fine tuning CV and dual Joystick mode if you have two. 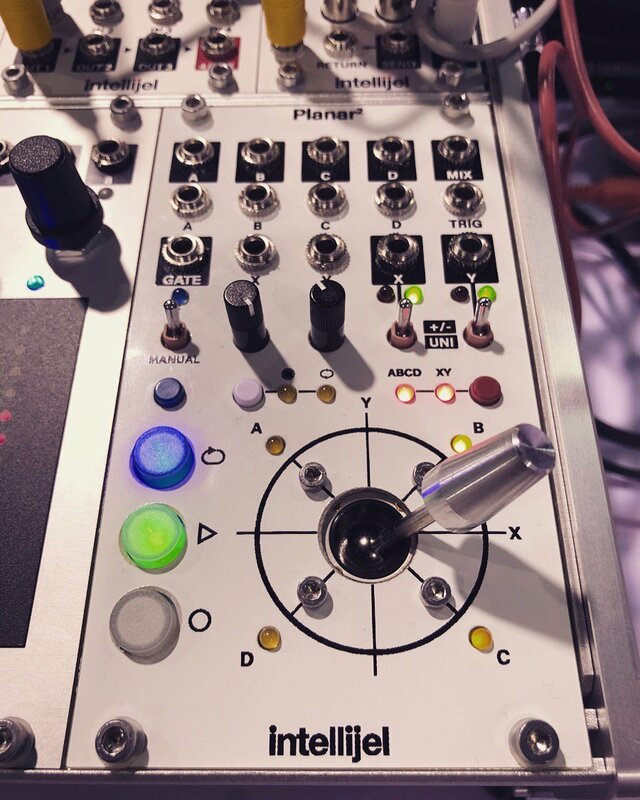 Intellijel Planar 2 is for Kinetic Out, Quadrant vs XY, Scanning, Grouping, Isolating, etc.  - Cartesian sequencer with memory for up to 64 complete STATEs. - 16 shapes... with TRANSFORM - not JUST sin, squ, tri, saw. Robaux SWT16+. 16 track 64 step sequencer (Triggers). 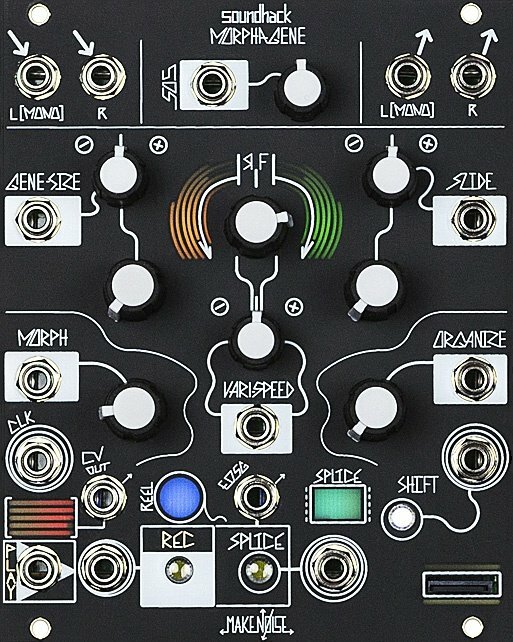 Intellijel Steppy [1U] $199. Now shipping from Intellijel direct. 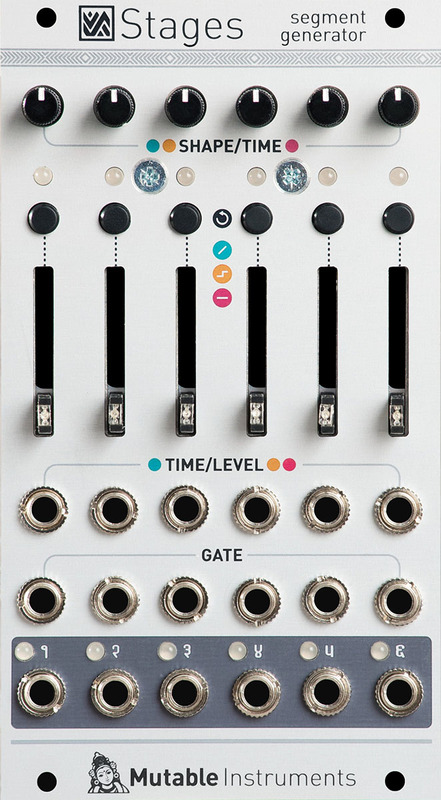 "Steppy is a 4-track programmable gate sequencer with eight internal memory slots, external clocking, numerous tweakable parameters, and a performance-first design aesthetic." - Tracks can be selected and modified in real time as the sequence plays. - Track patterns can be cleared without clearing its playback parameters, and all track patterns (along with their individual playback and performance parameters) can be saved as a preset to one of eight internal memory slots. Getting ready to dip my toes into the Eurorack world in the near future and wanted to get some hands on experience as there are LOTS of choices these days. Most of the Make Noise stuff was impressive, more of a "west coast" take on things (Maths, fixed filter, Mysteron got my attention). But for utility modules, JUST FRIENDS (Mannequins) looked extremely interesting! But the most fun I had was with a "processor" (wrong category for this thread, but had to mention) from Make Noise called Morphagene. Will be following this thread more deeply as I get closer to making purchase decisions. BTW, are you Eurorack folks integrating you racks with Reason and other gear, and if so, how? Yeah, Just Friends looks dope! As does all the Mannequins stuff, hah! Cold Mac looks super useful to have around. Also have a maths and I'm definitely thinking about adding another one at some point. I have a morphagene and yeah.... love that module. Endless things to do and discover with it. These get you CV (or audio if you desire) in/out of your DAW. ES Silent Way is a great suite of plugs for all kinds of CV and conversion duties. The robotic bean cv to audio and audio to cv REs are brilliant with these modules, too. I use the Vermona Quad qMI2 ( https://www.modulargrid.net/e/vermona-q ... -interface ) for euro MIDI duties. Really like this module. I then send clock reset signals from to qMI2 out to Pamela's New Workout ( https://www.modulargrid.net/e/alm-busy- ... ew-workout ) and sync it up. Works great and kind of serves as the main clocking source of the system. You get gates, LFOs, random, looping random, euclidean rhythms, all kinds of stuff from PNW. As far as getting audio back into the DAW I use four of these ( https://www.modulargrid.net/e/ladik-p-530-2ch-out-line ) and a snake going back into the UFX. It's been nice to have 8 channels with attenuators on hand. I was wondering about developing an RE for this stuff, thinking an all in one solution would be best. I've looked at the options you mentioned above, and while they appear to cover the basics I still have to wonder if it would be better to have on RE that handles all conversion in one unit rather than three. Does that make sense, or am I re-inventing the wheel here? Since you're using light pipe, how tricky is the calibration process? I noticed there is no calibration on the Robotic Bean stuff - is it necessary? I would think it would be handy to have at least a trim pot for every signal going out, or am I missing something? Ah, cool! I think an all in one solution would be really slick. To be honest, I haven't used the ES voice controller in quite a while. While what it can do for oscillators (analog osc in particular) is really incredible, I find myself not tending to use my modular in that way (as in calibrating an oscillator and sending it note/gate data straight through the ES modules). I thought it would be a really important part of my workflow early on but I just haven't turned to it that much. The calibration process with the expert sleepers RE definitely works fine. Can be a bit clunky to return to a patch after shutting down reason as it does not seem to save the calibration data (I could certainly be wrong about this, just haven't figured out how to do it), so you have to re patch some things on the software and hardware sides and re-calibrate, which can be a bit wonky. If I'm sending quantized note CV out of reason I tend to send it MIDI out (EMI) and into the qMI2 to be routed around the modular. The Robotic Bean stuff doesn't haven't any calibration process, just a solid CV to audio/audio to CV conversion. I think it refers you to the expert sleepers RE for sending quantized note CV in the manual (I've tried using the RB RE for note CV but the tracking/quantization doesn't convert well, it seems. I'm definitely no expert, though!). To be honest, attenuators/polarizers/offsets would be great to have built into the actual RE. Would be very cool. So after rambling for a bit there and thinking about it a little more... yes I think an all in one solution would be really slick! Perhaps with saveable calibration profiles and CVable attenuators/polarizers, MIDI controllable quanziters, and maybe some multiple inputs for CV mixing? Hah, sorry I'm getting a bit ahead of myself. Sorry for the long-winded response! Heh, as I said I'm definitely no expert, just relating my experiences with Reason + Euro thus far. Great to hear from someone using the Expert Sleepers modules with Reason. How are they? Do they work well with Reason? I've been thinking about getting an ES-8 to bring the modular stuff in & out of Reason. Would be a very powerful combination if it all worked as I hope it does. But I've not seen anyone demoing the set-up. I've heard of a couple of people using the ES modules with Reason. But beyond this information has been a little thin on the ground. I really like them! They do work great with Reason (and Reaper, only two I've tried). I've been finding it fun to set up a bunch of templates with the ES-3/6/7. Made a really complicated quad MIDI controlled quantizer involving a few PSQs, lots of LFOs, randoms, etc... Right now I'm having fun with a dual XY pad/dual fader/2x sets of 4 buttons for switching scales on the o_C (controlled via Lemur on the old ipad). What kind of stuff are looking looking to do with the ES-8, Faastwalker? 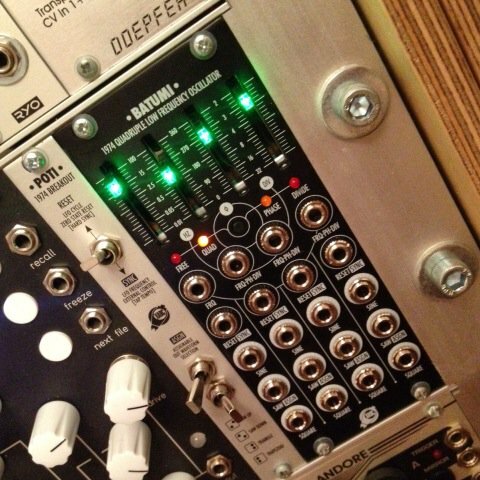 The main thing will be to utilise Reason's many sequencing, modulation sources to send to the modular / Eurorack gear. But it will also be useful to send CV/audio from the outside back in to Reason. I've only got a small Eurorack case (TipTop Audio Happy ending) with 80hp of space + a Kilpatrick Phenol. I'm thinking of concentrating mainly on audio sources & nice analog modules (for example) for the Happy Ending with Reason taking care of the sequencing / modulation stuff. The ES-8 is not cheap & may be a bit overkill for my requirements & small amount of space. The Phenol has a MIDI to CV converter built in. I'm having a lot of fun sending a modulation source from Reason to control stuff outside. It works really well & gives a taste of the sort of things i'll be able to do with more MIDI to CV i/o. Same here, always good to hear actual experience. I was interested in the USB model since my current interface doesn't have light pipe. That way you get bi-directional support with a single module, which would be simple and handy and wouldn't require any audio interface at all (and I could use my iPad or my computer). Plus there's also bi-directional light pipe if I get an interface that supports it (which I'm look into). Vermona´s QMI2 looks sweet for MIDI - how is it's clocking? Clocking is something else I'd be interested in having working simple and tight.